This garage shoe storage bench gives the kids a place to put on their shoes and keeps dirt out of my house! How are you doing with the decluttering challenge? It is time to start a new zone! I have decluttered 373 items from my home so far this year (I will keep the totals updated in my sidebar each month). Learning how to declutter your home (and taking the time to do it) is time-consuming, but completely worth it. For my second zone, I decided to tackle our garage and storage space. So, the tip for this week is going to be how to make a garage shoe storage bench (and why you need one!). If you are just starting the challenge then you can start here or go back to learn some bathroom decluttering tips before you tackle your garage and storage area. The garage and storage room is a catch all for the items I have decluttered. This year I made the rule for myself that I will not be saving a ton of stuff for later or for a garage sale. I get caught in the trap of saving it for a garage sale, which usually never comes, and even if it does I tend to make very little money considering I stored the darn things for a year. This time I am going through all the items in our storage area and giving myself one week to sell them. Things I can't get rid of in that time will be donated. This is helping a lot with the storage area, although it is still taking me a while to get through the items I have in there. So, that leaves the garage. The biggest problem with our garage tends to be shoes. I do not like shoes in the house. If you get used to taking your shoes off before you come in the house you will never track extra dirt, dust, and water into your living space. 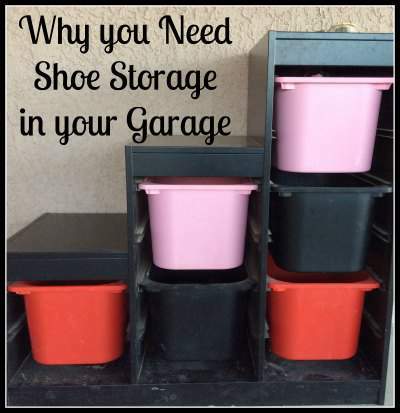 The best place to keep shoes outside is in a garage shoes storage bench. That way there is a place to keep the shoes and a place to sit while you are putting them on. Shoes will track lots of dirt, dust, and rain into your living area. That makes it harder to clean and keep clean. It is also nice to have your shoes ready when you need them and a place to put them (immediately) when you take them back off. Finally, it helps clear space in your closet for other things. I do keep some of my shoes in my closet (mainly my dress shoes and shoes I only wear occasionally). My kiddos keep all of their shoes in the garage shoe storage bench. Most shoe storage options (like these ones at Home Depot) are for closets. Using a garage shoe storage bench frees up that closet space for other things. It will also help you realize exactly how many shoes you have so you can make a more informed decision as to how many you want to actually keep. Half of the battle in decluttering is truly understanding the amount of things that you own. Although I still have too many shoes, seeing the sheer number of them has helped me get rid of quite a few. I tried many different things for shoe storage and some worked, some didn't. The best thing turned out to be a cheap garage shoe storage bench we made from an ikea organizer. The one we purchased has 6 bins (we currently use one for each of us plus an extra for the boys baseball shoes). Each bin can fit 3-4 pairs of my shoes, 1-2 of my husbands and I think we could fit as many of the kids shoes as we wanted in them. We choose one that is in the shape of a stairway. This way the kids can sit on it as they put on their shoes. It makes a perfect garage shoe storage bench and it ended up costing about $60. There are lots of options to purchase a garage shoe storage bench. These options from Home Decorators are cute, but are expensive. We used to use a storage bench that sat in our entryway and that worked, but I like the garage shoe storage bench better because it leaves that indoor space for other things. Plus, the kids (and I) get used to taking off our shoes before we even get into the house. Before I went to Ikea I used these wire storage cubes to make a garage shoe storage bench and I put a cloth bin in each cube to hold the shoes. It worked well, except the cloth bins took a beating. It would work much better with plastic bins. It was actually a little more expensive than the Ikea version, but if you do not have an Ikea nearby then this will work well and it still ended up being fairly cheap. A four person family could have this type of garage shoe storage bench with a bin for each person for $40. It is a great thing to have to help declutter both your garage and closets. Will you come declutter my house? You seem to be really good at it. 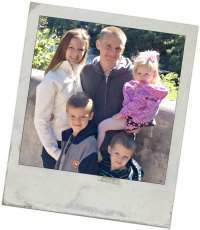 Visiting from the Great Blog Train.